I recently stumbled into Adam Maxwell’s Fiction Lounge, and I’m glad that I did. 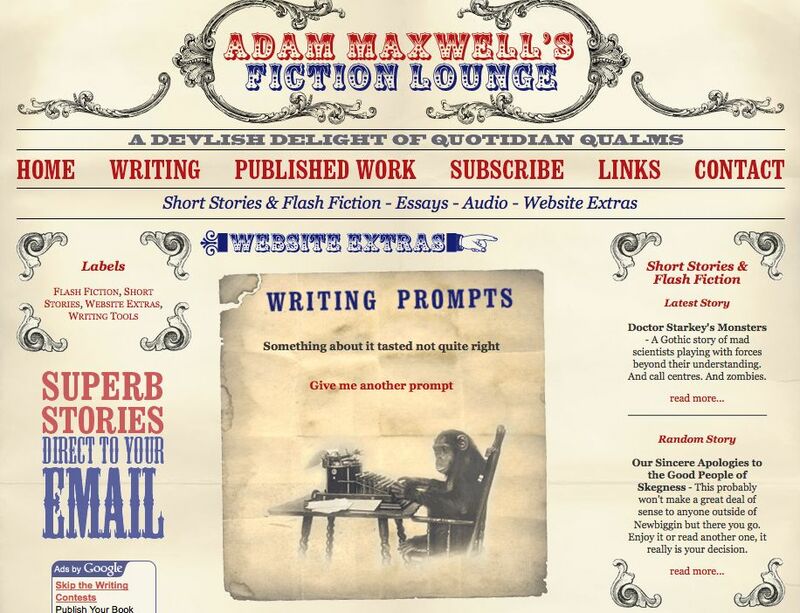 While clearly a vehicle for promoting the author’s work, Maxwell’s site is attractively designed and offers a free writers’ prompt tool, which might just be enough to prod you out of a fit of writer’s block should you happen to experience that nasty affliction. There’s also a fun character name generator, which is mildly addictive, and an award-winning podcast of Maxwell’s short fiction. Enjoy! very interesting site, although i’m having trouble with the tools you highlighted. wondering if there’s a kink in my pc or the site? Someone else told me they had trouble too — works fine for me; perhaps requires a certain version of Flash or something?